I’ve been thinking a lot about pain recently. Not because I’m in pain, but because for the first time in years I’m out of it. It was only when the veil was lifted that I recognized and could appreciate how much chronic pain had disrupted and skewed not only my life and, more importantly, how it permeates and overshadows the lives of so many people who are cursed with it. I led a remarkably pain-free life until about ten years ago, playing various sports, backpacking, and walking the 1½ miles to and from work every day. There were some interruptions–an Achilles tendon rupture surgery (basketball), a minor knee surgery (running and tennis), and other sports ailments. But chronic pain wasn’t part of my life. The trouble started in 2009 with the emergence of lower back pain that made it impossible to walk for more than a few blocks or stand for more than a few minutes without intense pain running down my leg. It forced me to find something, anything, to sit on in order to get a temporary respite. Physical therapy, back braces, cortisone shots, and acupuncture were futile. He was right. As the dose was reduced, my pain increased. I walked to work only on rare occasions–and then only by stopping to sit on park benches for a few minutes at three or four places along the way. Walking on the streets, I stopped to sit on fire hydrants every few blocks. Melissa rushed into crowded subway cars to grab a seat for me. And whenever we arrived at airports I sat as Melissa and the kids stood and waited to get our baggage off the carousel. I was their ward. I wasn’t thinking at the time about all the ways pain had interfered with my life and caused me to devise strategies to cope with and get around it. I was just doing my best to go on with as many of the things I enjoyed as possible. And to all except Melissa–to whom I whined constantly–I was a happy camper. But as I trudged along, I fretted more about my back pain than my cancer. The thing about pain is that it’s hard to compartmentalize. Except for the relatively rare occasions when something triggered a fear that I was going to die from the cancer, I could go about life without constantly thinking or worrying about it. But intense pain is with you constantly. To state the obvious, it hurts. At least for me,the pain was impossible to put out of mind; a constant cloud over my life. I had another spinal operation in September 2016 after a few more rounds of cortisone shots, physical therapists, and a chiropractor couldn’t help me. It seems to have worked. Although it took the better part of a year, I’m now pain free. As I walked alone through the Upper West Side of Manhattan looking up at apartment Christmas lights one night in December I silently marvelled that I didn’t have to worry about finding a place to sit, or whether I could make it home on foot. I could just enjoy the lights, the walk. I felt like I’d been released from a prison. Since then, I’ve found myself pausing after doing one unremarkable thing after another that I couldn’t have done without pain (or at all) before: standing on line waiting to get into a movie; talking to a friend on a street corner; standing in a subway car without frantically hoping a seat would open up before the pain became intolerable. I’ve revelled in these small moments, constantly noting them with some amazement to Melissa who’s probably sick by now of hearing about them. I’m recounting all these personal travails and small triumphs now not to garner sympathy but because it was only when the veil of pain was lifted that I realized, looking back, how many ways pain had altered my life. And, more importantly, I came to recognize and appreciate the burdens borne by the millions of people plagued with chronic pain–those who may never be released from their prisons: the limits pain imposes on their freedom to choose what to do; the extra weight they shoulder as they go to work and take on the daily challenges we all struggle with; and the strategies they must devise to cope with and circumvent their pain. In contemplating their ordeals from my new perspective, I’ve had two overriding reactions. The first was a feeling of deep respect, as well as empathy. I had a similar awakening years ago when, after an Achilles’ tendon operation, I was in casts and on crutches for several months. Struggling just to get dressed and make it to the office before even starting each day’s work was an educational experience that gave me profound respect for those with serious disabilities who regularly manage to navigate all of life’s challenges that even the luckiest of us bemoan–like running a marathon with 10 pound ankle weights. Now I understand that chronic pain–often invisible–may be among those serious disabilities. My second reflection was to appreciate how so many millions have fallen prey to the opiates that were foisted upon them by doctors–some unsuspecting, some criminal–as non-addictive cures for their pain. 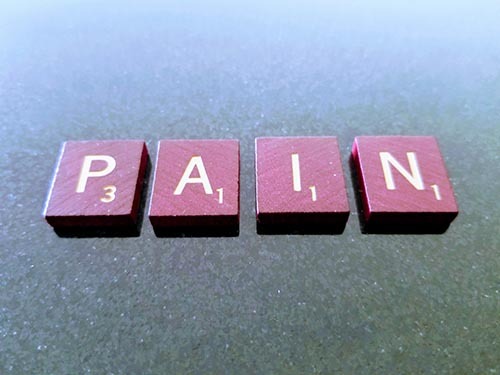 Living in constant agony, it’s amazing that even more chronic pain sufferers haven’t fallen victim to what was a massive and deadly fraud by the pharmaceutical companies that peddled these drugs as harmless panaceas. And now the picture has become further clouded, as honest, diligent doctors are afraid to prescribe appropriate doses of pain medication for suffering patients who need them. Find things you can still do without pain, and enjoy them–for me it was working out on gym equipment that didn’t require weight-bearing standing, like stationary bikes and elliptical equipment; or reading while riding on buses I had to take instead of walking. Figure out how you can best do those things you like to do but can only do with pain–for me this meant taking a portable chair on our trip to Scotland, and taking fly fishing float trips in boats so I could sit when the pain became intolerable, rather than wading in the river, which I would have otherwise preferred. Better than not going. Find someone who you can whine to–so you don’t have to bear it all yourself or burden everyone else with your woes. Melissa was my outlet, my empathizer and bolster. Hopefully others will be lucky enough to have a supportive partner, good friend, or family member. Don’t be resigned to live with pain–until you’ve searched for and tried all the legitimate options for getting out of it. And, while surgery is a last resort, for me it’s been worth the temporary pain and difficulties of recovery. Opium and its derivatives have been used for pain for at least 100 years if not more. Briefly Vioxx and other similar insets provided some degree of pain relief until it was found that they can cause heart attacks. There is a non-addictive drug called subutex that my good friend uses for his chronic back pain. Subutex is a generic drug. For Doctors to prescribe it they have to take a course and go through other rings of fire. Why? Large pharma did not want their lucrative opiate derivatives business affected. So they made it hard to prescribe subutex. To prescribe addictive pain killers requires none of the arduous process a Dr must go through to prescribe subutex. Instead of spending billions of dollars on the military, wouldn’t it make sense to do a Manhattan project for painkillers? Thank you for sharing your experiences and your wisdom. For those of us who have been fortunate to live a pain-free existence, it is a reminder of how grateful we should be….every day. The absence of pain is something to celebrate. The opiate edipemic continues to worsen and devastate so many individuals and families. It is time our government took some real action. Your spirit and love of life is inspiring and infectious. Beautifully written. Thank you for this thoughtful article. My 95-year old mother has lived with chronic pain most of her life since it hit in her 40’s. I think she has used many of the strategies you recommend, and except for a few low points, has managed to be a positive, productive person – and an awesome, supportive mother. In contrast, I have been completely spoiled by good luck and hardly ever had any pain, but when I do, I try to contemplate what my mother has faced. It gives me, as you say, such empathy for her unbelievable perseverance all these years. The strength and bravery of those who suffer and function in the face of real pain is truly inspiring. Very moving and memorable. Great credit goes to Melissa for being the wonderful human being and partner that she is, providing the understanding ear for the complaints and the assist when needed. I know Rich you are not looking to be commended on your courage and determination to keep moving and get the most out of life. But I do cheer you for it. Rich, I will keep the lessons of this in my mind and heart. Another great piece, Richard. Thanks for keeping me in the loop on your blog. For sure, as we age this will be if not already a part of all our lives. As you discuss methods of helping alleviate pain, and given the newfound acceptance of cannabis as a means of doing so, I’ve heard many are finding this to be a wonderful way to cope with pain and avoid opioids. We read today how pro athletes are moving away from opioids to cannabis and discovering how much better it is for them. I also have endured some of the pain you describe with herniated discs in my neck that have flared up 3 times over the past 30 years, and when it does, one really does get to understand how much we take for granted in our daily lives when pain-free, as you point out. I was not aware you had an Achilles issue but have been told that is one of the more painful things that one can go thru when it happens. I once met Bill Bradley and got into a discussion with him at SFO. He told me that one should not play basketball after the age of 40 or you could be a likely candidate for either an achilles issue or an ACL issue. I’ve not heeded his advice and still play weekly, although at a slower pace, but always have his words in the back of my mind fearing what might be inevitable at some point. Always enjoy your writings. Pls keep em coming, and be well, my friend. I want to say that this was a very accurate account of a chronic pain sufferer. No one can really understand unless they have been there. Sadly to say, I was also diagnosed with chronic pain. I have been on opioids for the last 10 years and it is the only way I am able to get through the day. After a multitude of steroid shots (so many I have lost count), physical therapy, acupuncture and chiropractic manipulation, opioids were my only option. My pain management doctor did refer me for a surgical consultation but the surgeon said that he could only guarantee a 50% reduction and I would still have to be on the opioids for pain. So for right now surgery is not an option. I am so glad that you are pain free and I will pray that you remain that way.